Edgar Degas was one of the most renowned French painters during the 19th century Impressionist’s art movement. Pissarro said about him: <<He is an awful men but he is loyal and honest too>>. He grew very fond of dance since he was firmly convinced that ballet <<was the last surviving form of art coming from the antique Greece>>. <<Waiting>> is a pastel on paper: according to the tradition, it displays a young dancer with her mother waiting for an audition. 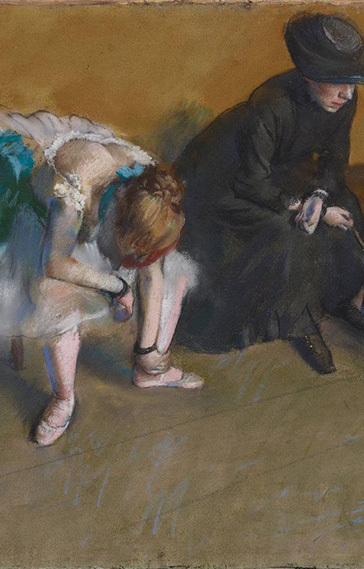 We can see an aching and worried dancer sitting beside her thoughtful mother, both of them hunching forward while sitting and waiting on a bench. Amandine is a small-town girl with an immense passion for dancing. She is the daughter of Ambroise, fisherman coming from the small Normandy village of Yport, and of Maria Assunta, a sicilian migrant coming from Zafferana Etnea. Amandine is just a step away from becoming an etoile: still an audition for her, tiny little dancer with nerves and bones at the same time feeble and hard as the Cote d’Albatre’s cliffs, then she will finally step under the spotlight. Her newly-widowed mother (Ambroise recently drowned during a storm in deep-sea) is sitting beside her on the bench while on the outside a thin and constant rain is pouring down. But Amandine is unable to dance: her feet are plagued with blisters and she can’t stand the pain any longer. Her lifedream and sacrifices are vanishing into her ballet shoes. Maria Assunta is aware that another chance will never come again, so she’s busy with praying.. Time is running out and there’s not time left for prayers, she suddenly stands up and open the window: with a black umbrella, just like Mary Poppins, she starts flying all over the world, looking everywhere down for the right solution. Will her brave mother be able to find the right shoes that may fit her feet as a glove, light as a feather and plushy as a couch? Still one hour to the audition. In the meantime she has crossed with her magical umbrella over France, England, Holland and Germany: she tried aimlessly hundreds of shoes before moving southern to her homeland, Sicily.. Hopes are getting lower and lower when, out of the blue, a white stork coming from the Horn of Africa flies alongside and she aks her why she is so concerned. Desperately, she explains to her motherly’s preoccupations. Then the stork reveals her that,during her migratory journeys, she always takes a rest in a big nest she built on the roof of a shoemaker’s factory in Barletta. All the people working in there say that these shoes are miraculous! Go on and fly Maria Assunta Poppins! But the time flies as well! In a blink of an eye, she goes down the chimney and notices the moulding machines whose bang out fresh shoes for the most delicate feet. Then, she frantically asks for an advice for her beloved daughter to the Quality Management Responsible. She says to not be worried about it since the patented DRY’N AIR GEL insole will melt as snow under the sun and she gives Maria a 35 size into an eco-friendly box. Let’s fly on Maria Assunta! And in an instant she’s right back next to her sobbing daughter. Amandine is pretty much sure it is really over but she can’t even think about it because she hears them calling her: <<Amandineee!>>. It’s her turn. 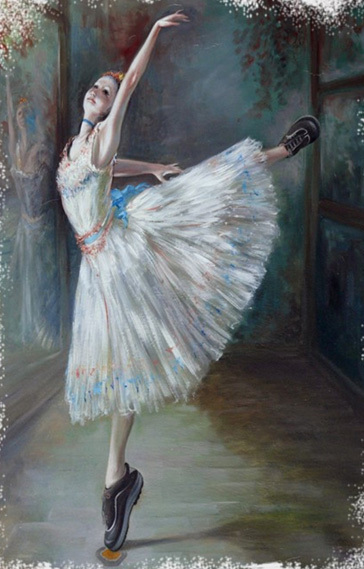 She puts quickly her shoes on and the music strikes up: flutes, oboes, clarinets, bassoons and then bass tubas, castanets, timpani… she is now Odette, the White Swan twirling, jumping and standing on her tiptoes. She looks up and smiles awesomely, while the jury is blown away by her performance. Taking inspiration from Degas masterpiece, Marco Rindori gave Amandine the joy of dancing back, with comfortable and safe shoes of a top-tier italian manufacturer: BASE PROTECTION. This way the <<Waiting>> has become <<The Triumph>> of Amandine.